Land managers: U.S. Army Corps of Engineers, N.C. Wildlife Resources Commission. Note: Some or all of this trail is on gamelands and hunting is allowed. Learn about local hunting seasons here. Piggyback trail: Falls Lake Trail, a k a South Shore Trail. Connecting trails: Neuse River Trail. Falls Lake MST Section No. : 1. 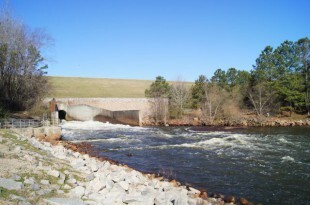 Trailhead/Access: Falls Lake tailrace at Falls of Neuse Road and Raven Ridge Road. Click on map below for specifics. Eastern end of the MST along Falls Lake, at the dam. Section 1 of the Falls Lake portion of the MST is at the epicenter of an emerging playground. From the southeastern trailhead parking lot at Falls Lake dam’s Tailrace Fishing Area, you’ll have access to the Neuse River Trail, a 28-mile greenway scheduled to be finished in early 2014 that will extend the MST to Johnston County (where another 5 miles of existing greenway takes you into Clayton). Meanwhile, at Raven Ridge Road the city of Raleigh is building trail that will connect with Shelley Lake and the Crabtree Creek Trail via Raleigh’s greenway system. As for Section 1 itself, the southeast end has a surprising, for the Piedmont, amount of elevation, with a third-of-a-mile climb gaining more than 100 feet from near the trailhead. Past the Falls Lake Visitor Center, the trail is more characteristic of the rest of the MST along Falls Lake, dipping in and out of coves and spending quality time along the lake. An option gives hikers the opportunity to take in the Falls Lake visitor center (and restrooms) or take a more sylvan, and slightly shorter, bypass. Geology Highlights: This trail section includes large rock exposures of Falls leucogneiss, an unusual rock unit that has geological and historical significance for this part of North Carolina. There is also abundant geological evidence of an ancient fault zone (along the “rock slab creek“).